The new magazine for Bromyard & the villages is here! To get the magazine for the next 12 months and the previous 3 months please sign up for a yearly subscription, only £18.85 (£18.00 + 85p PayPal fee) - click here....! 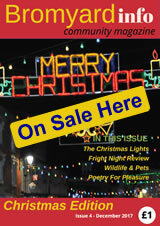 Buy a magazine subscription for friends or family. An ideal gift for anyone who wants to read the magazine on their tablet, laptop or computer (any device that can read a PDF). Choose a design for you card - then click the Buy Now button. When you have paid for your gift card we will email your chosen card which you can then forward to your chosen recipient. The email will include a link to the subcriptions page and instructions for using the voucher. Choose one of the following designs for you card.